Join this 1-hour class located in the Asakusa area and learn some techniques from you experienced and friendly expert for making Japanese replica food! Replica food was invented in the 20th century in Japan and has been inherited by Japanese artisans. It has become very popular for Japanese restaurants to display delicately made replica dishes showcasing in frond of restaurants. 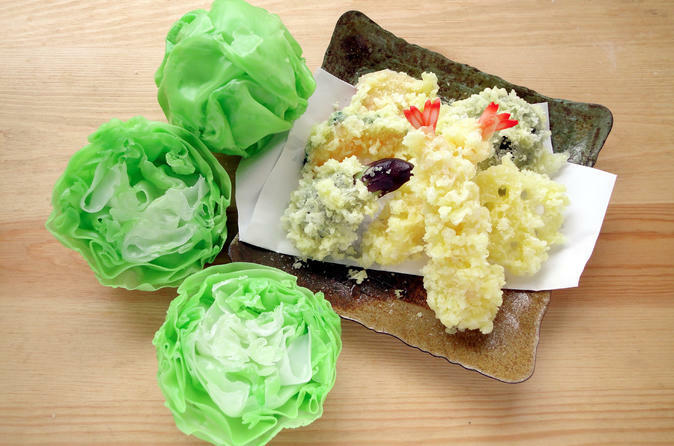 Learn how to make 2 kinds of tempura, one of the most symbolic traditional Japanese food, by choosing deep fried prawns, eggplant slice, pumpkin slice, or shiitake mushroom. You will also learn how to make the freshest looking lettus replica. When the class is over, you can bring home the food replica you make as a souvenir!